Hike, paddle, bike, or cross-country ski along beautiful trails through sites made famous by Adirondack guides, artists, writers, entrepreneurs, colonial settlers, and combatants in the French and Indian and Revolutionary Wars. Visit abandoned iron mines and the ruins of tanneries, famous Adirondack great camps and old resorts, lost villages, Native American battlegrounds, and the homestead of John Brown, catalyst for the Civil War. Visit the scene of America's first naval battle and marvel at geological wonders like Indian Pass, Canajoharie Gorge, Chimney Mountain, and the tufa caves of Van Hornesville. Detailed directions, maps, photographs, and vintage postcards. 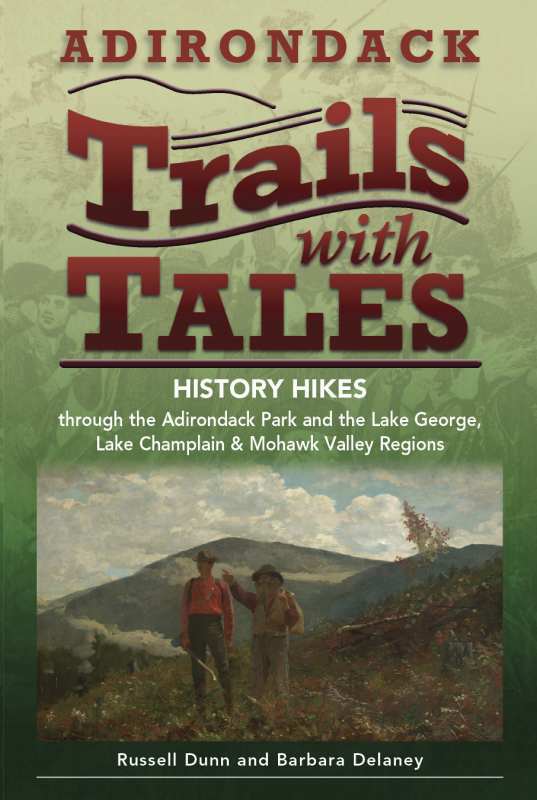 About the Authors: Russell Dunn and Barbara Delaney, both New York State-licensed guides, are the authors of Trails with Tales: History Hikes through the Capital Region, Saratoga, Berkshires, Catskills & Hudson Valley (Black Dome Press, 2006). Dunn is also the author of an ongoing series of guidebooks to the waterfalls of eastern New York State and western New England, including Adirondack Waterfall Guide: New York's Cool Cascades (Black Dome Press, 2003), Catskill Region Waterfall Guide: Cool Cascades of the Catskills & Shawangunks (Black Dome Press, 2004), Hudson Valley Waterfall Guide: From Saratoga and the Capital Region to the Highlands and Palisades (Black Dome Press, 2005), Mohawk Region Waterfall Guide: From the Capital District to Cooperstown & Syracuse (Black Dome Press, 2007), and Berkshire Region Waterfall Guide: Cool Cascades of the Berkshire & Taconic Mountains (Black Dome Press, 2008). He is also the author of Adventures around the Great Sacandaga Lake (Nicholas K. Burns Publishing, 2002), and a soon-to-be-published guidebook on kayaking the waterways of the Capital District Region.